The Hawai‘i State Water Well project digitized all of the water well files at the DLNR, Commission of Water Resource Management (CWRM). Though public information, the files existed previously in print/paper format, so prior access to the information required going in person to the CWRM office. 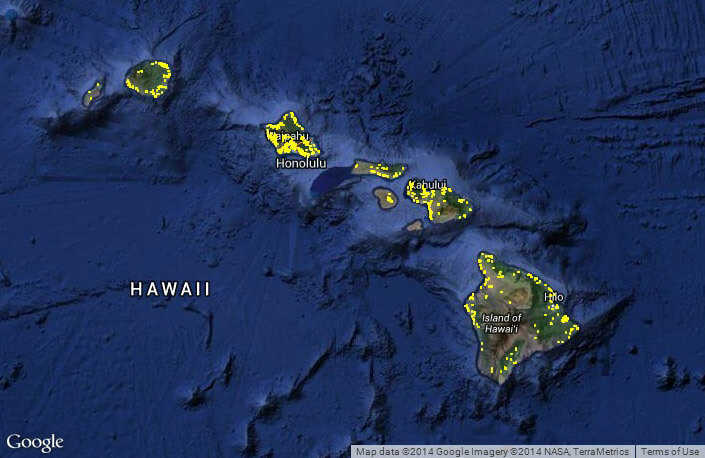 The map below shows the location of each water well in the State of Hawai‘i. Click on the image to be taken to an interactive version of the map, and database from which individual water well files can be downloaded. A list of water wells (with some additional information) is provided in tabular format, with a downloadable link to the digitized information at right. Note that although the record of drilling wells dates back to the 1800s, a drilling permit has been required only since 1987, so downloadable records prior to 1987 may not exist. Also, the digitization effort ceased Nov. 2012 so files for wells drilled any more recently will be absent.